Support services for vulnerable adults, located on South End. It was previously a translation bureau called Kwintessential. 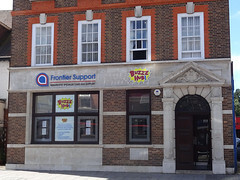 According to the Kwintessential blog, this branch opened in June 2011, but as of August 2012 there was no mention of it on their main website. Last edited 2019-02-16 16:02:20 (version 14; diff). List all versions. Page last edited 2019-02-16 16:02:20 (version 14).